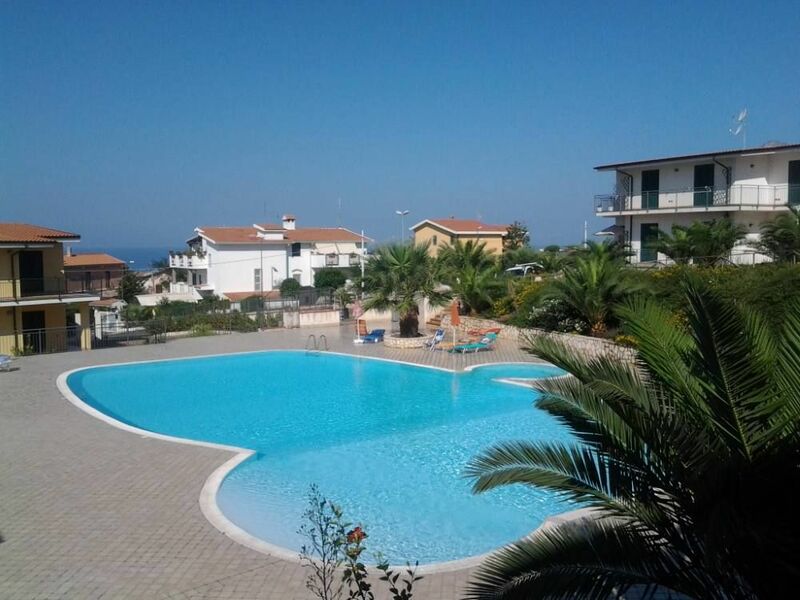 Lovely, bright and airy apartment to rent in Scalea. The apartment is located on a secure and private holiday complex with electronic gates and a large communal swimming pool with children’s section, This apartment has the benefit of being located close to the swimming pool and given its first floor location, it provides the option to sleep safe with the windows open at night. The apartment has open plan living room with sofa bed and fully equipped kitchen corner, master bedroom, shower room and a terrace. The apartment sleeps up to four people and comes fully furnished, television, washing machine, oven, fridge and small freezer etc... Both bedroom and lounge have French doors which open onto the Balcony that offers views of the communal garden, sea and swimming pool. The apartment has its own private parking space and during the summer months, you will find a water park, supermarket, hotel, restaurant and bar within walking distance. The apartment is available to rent for a couple of days or longer. Book early to avoid disappointment. 1st class all the way. The apartment overlooks the pool and the complex was very quiet, it's a gated community so very safe. There was free wifi which is a bonus. The town is a short walk away and beaches are fab. All in all a great holiday which didn't disappoint in any way and we would highly recommend this apartment for friends or family. "The apartment was very clean and tranquil. From the balcony we had view of the sunset. The pool is very well maintained and parking is not an issue. Everything was very nice. We would love to stay here again. 2.noise- There is no noise. Really you have possibility to have a rest from city noise.At the same time it is possible to have enough entertainments, having gone down on quay. 4. view - it is perfect balance between human activity and the environment." La casa non sarebbe male, per carità, ma ci sono degli inconvenienti di gravità tale, da renderla sconsigliabile. Innanzitutto non è presente l'aria condizionata e ciò significa che nei mesi estivi il soggiorno nella casa può risultare davvero sgradevole. Poi, circostanza ancor più grave, il proprietario risiede all'estero e la casa è abbandonata a sé stessa. Per cui se ci sono degli inconvenienti si è davvero nei guai. Io, per esempio, ho trovato la luce del bagno, il televisore ed il frigo (in piena estate!) non funzionanti. Ed ho risolto tali problemi solo grazie alla cortese disponibilità di una persona del luogo conosciuta nell'occasione. Non certo per l'opera del proprietario, che si è limitato ad una mail di scuse tanto formali quanto inutili. La circostanza gravissima è che il problema del frigo non funzionante l'ho potuto risolvere solo al quarto giorno (su otto) della mia permanenza nella casa. E ciò, dato il fatto che si era in piena estate, ha reso la mia vacanza un vero e proprio incubo. Valutazione finale: casa assolutamente da evitare. abbiamo trascorso una bellissima vacanza, abbiamo visitato tutte le spiagge nelle vicinanze , appartamento corrisponde alla descrizione ed è in una posizione ideale.